Damon does not look at all pleased with Bonnie in this photo, does he? We wonder if these two will ever hook up. 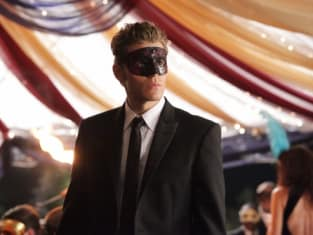 The Vampire Diaries Season 2 Episode 7: "Masquerade"
You aren't gonna kill Katherine... I am. Permalink: You aren't gonna kill Katherine... I am. Tell Damon and Stefan to give me the moonstone or I will rip this town apart until it rains blood.